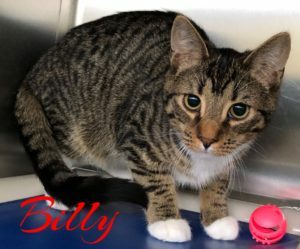 Billy is a gorgeous tabby and white male, born on 8/16/18. He was trapped as a kitten in a colony in Elmont. Billy was fostered and brought to Last Hope, where he’s waiting for his special someone. Could that someone be you? Come meet this sweet boy at Petco Wantagh! This entry was posted in 6 to 12 Months, Adopted, Adopted Cats, Cats, Male, Petco - Wantagh. Bookmark the permalink.